New installments to the Star Wars saga are drawing new generations of fans to the franchise, and it’s likely that Luke, Leia, Rey, and Kylo Ren will be some of the most recognized movie characters for years to come. Nearly as recognizable as the iconic characters is the masterful music by John Williams. His work on the original trilogy gave us some of the greatest film scores ever created, and he continues to enhance the newer films with original and familiar themes. If you know a young Star Wars fan who is a new piano student, capture their attention and motivate them with easy Star Wars piano sheet music. Playing music from their favorite film will keep them practicing hard, and the many different music selections available will allow them to work on a variety of skills. Even kids who aren’t as familiar with the films can get caught up in the drama of Williams’ music. Arrangements of Star Wars music are available for a variety of skill levels, but the selections below from musicnotes.com focus on newer piano students. These beginner and easy pieces capture the melodies and rhythms that students love in arrangements that they can successfully play. Star Wars Main Theme: Almost anyone could hum the victorious main theme, and it must be included in any collection of Star Wars sheet music. This first arrangement is designed for a true beginner, with only a melody line with note names labeled. For students with a little more experience under their belts, the next arrangement, for easy piano, moves the melody between right and left hand and fleshes it out with one and two-note left hand accompaniment. Get The Imperial March for easy piano. Cantina Band: This jazzy number is fun to play, and can help facilitate practice of accidentals. An easy one-note left hand allows students to focus on the unusual rhythms and sharps in the right. Leia’s Theme: The original trilogy was ahead of its time in introducing a strong female character like Leia, and Leia continued to display strength and leadership into the more recent films. Fans of any generation, then, should recognize her theme. Get Princess Leia’s Theme for easy piano. Yoda’s Theme: It might take a true fan to recognize Yoda’s theme, which isn’t quite as well-known as the music above. With a little less fanfare, this piece strikes a more magical tone, fitting for the wise and mysterious character it embodies. The music of Star Wars covers a range of moods and emotion, and beginning piano students will enjoy exploring all of them. A new school year means a fresh start– a chance to try new strategies, routines and materials. This year, consider featuring a composer of the month in your music classroom. It’s an easy way to introduce your students to great composers even if you don’t have time to spend whole units getting to know them. With a little wall space for visuals and a little class time, your students will have the opportunity to meet a composer, learning basic facts about their lives and contributions. For each of the composers below, you’ll find a bulletin board pack– a printable pdf file with a large image of the composer, fun facts about the composer, and a list of each composer’s “Greatest Hits.” The posters are designed to be clear and basic so that after a month of seeing these posters on the wall, your students will recall the key facts. You’ll also find a kid-friendly, one-page biography. To follow up any biography, you can use Meet the Composer Job Application Worksheet to review the experiences and skills that shaped that composer. Additional worksheets, lesson plans and other resources are also provided for each composer to extend your study beyond the biography. With these materials, introducing your elementary music class to a new composer each month will be fun and easy. Among all the exciting things they’ll learn in your class this year, they’ll meet some some of the world’s greatest composers. If you want to introduce a composer that will instantly engage your students, John Williams fits the bill. Best known for his iconic movie scores, Williams demonstrates that artful orchestral music is not a thing of the past. 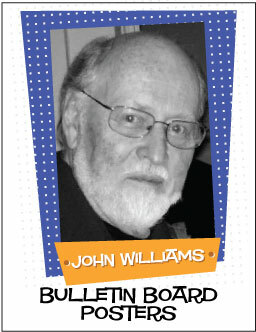 The John Williams Bulletin Board Poster Pack provides an informative visual focus for any study of the composer. This poster pack is a ready-to-use resource that will introduce students to key information about John Williams and reinforce the facts again and again. You are just a download and print away from a quick and easy visual display that will reinforce your focus on teaching John Williams. The intentionally simple design of the posters allows main points to stand out so that students will notice and remember them. A large and small portrait help students place a face with the name. Probably most importantly, students will likely recognize at least one of their favorite movies on the list of well-known film scores by this composer. John Williams makes a great first composer of the month choice, since he is a living composer whose work students have likely been exposed to. The concepts and skills learned through a study of Williams can also provide a bridge to future composer studies, making them seem less distant. Or, if you’ve already started composers of the month, Williams can provide an exciting variation. A John Williams lesson or unit could also be a great introduction to an exciting study of music in film for students of any age. The John Williams Bulletin Board Poster Pack brings a visual anchor to a study that demonstrates the power of music to take us to faraway places. Would you like to be able to quickly evaluate the listening skills of your primary age music students? Listening glyphs make it easy, and John Williams music makes it fun! A glyph is a record of fact in picture form. A listening glyph indicates “facts” about students listening skills. How they respond, choosing one crayon or another to color a section of the picture, demonstrates their understanding. Example: Students listen for “Steady Beat.” If they hear a steady beat they color Princess Leia’s face pink. If they don’t hear a steady beat they color Princess Leia’s face blue. Three General Listening Glyphs – The general listening glyphs are intended for use with any piece of John Williams music. Students will listen for musical elements like steady beat, staccato and legato, and tempo. Three Listening Glyphs for John Williams Movie Soundtrack Themes – These listening glyphs are soundtrack theme specific. Three Blank Listening Glyphs – The blank listening glyphs give music teachers the most freedom. You’ll be able to use the fun pictures to engage your students while asking them questions you would like them to listen for. Perhaps you just learned about the brass family. The freedom this worksheet provides will allow you to ask students if they heard a trumpet, french horn, trombone or tuba. Extension Ideas and Instructions – A page is also included that provides extension ideas and instructions for use of the listening glyphs. Wish you had an easy to assess your music classroom students all at once? Listening glyph worksheets make it as easy as it gets! Listening glyphs are perfect for assessing K-3 students as they listen to music recordings. As they listen student are asked questions like, “Is the music fast, medium or slow.” They respond by coloring an area of the picture one color or another. For this listening glyph music students are asked to listen for a “Steady Beat.” If they hear a steady beat they should color Princess Leia’s face pink. If they don’t hear a steady beat they should color Princess Leia’s face blue. This simple response lets you know what each student is hearing immediately, and allows you to quickly shift your instruction to address student understanding. The Star Wars | Music Listening Glyph Worksheet pack includes three listening glyphs and an “About This Activity” page. The General Listening Glyph is designed for use with any piece of Star Wars soundtrack music. Students are asked to listen for steady beat, staccato/legato, tempo, amplitude (dynamics – loud/soft), the size of the music group, weather there are singers or not, and if they hear string family instruments. The Star Wars “Main Title” Listening Glyph asks students to listen for music elements in the “Main Title” theme from the original movie soundtrack. The final version is a Blank Listening Glyph designed to provide the greatest freedom to music teachers. Teachers can choose any piece, decide on the musical elements they want their students to listen for, and fill in the blanks to reflect those goals. The last page of the packet includes instructions and lesson extension ideas. John Williams music has become a hit with every generation since the Stars Wars hit the big screen in 1977. Since then William’s score for Star Wars was selected by the American Film Institute as the greatest film score of all time.